Currant American Brasserie reminds me of one of my ex-girlfriends. She cleaned up really well and looked great in eveningwear but was even more attractive in old jeans and with her hair down. Currant (140 W. Broadway, Downtown) has an elegant look, somewhere between a fine-dining establishment and a French corner bistro, and its dinner offerings are great. But where it really shines is in its lunch menu. Currant was the second stop on my “CityBeat World Fare Best Sandwich on the Planet” tour. Specifically, I went there for the croque monsieur, France’s unique version of the grilled ham-and-cheese sandwich with béchamel sauce. Legend has it the first croque monsieur was “invented” when French workers left their lunch pails by a radiator, returning to find the cheese melted into the ham and bread. Its first documented appearance was on a Parisian café menu in 1910. Currant’s version, featuring country ham and Gruyere cheese (Emmental is, perhaps, more traditional) in between slices of crusty French bread and topped with béchamel sauce, arrives after a quick trip under the salamander. It’s what grilled-cheese sandwiches dream of being when they grow up. Perhaps it’s the ham-and-cheese sandwich taken to its logical extreme—or maybe not, as Currant also offers a croque madame, the same thing topped with a fried egg. Either sandwich is a deep draught from the comfort-food well. But if Currant’s croque monsieur is a good sandwich, its unique take on the Reuben is a great one. 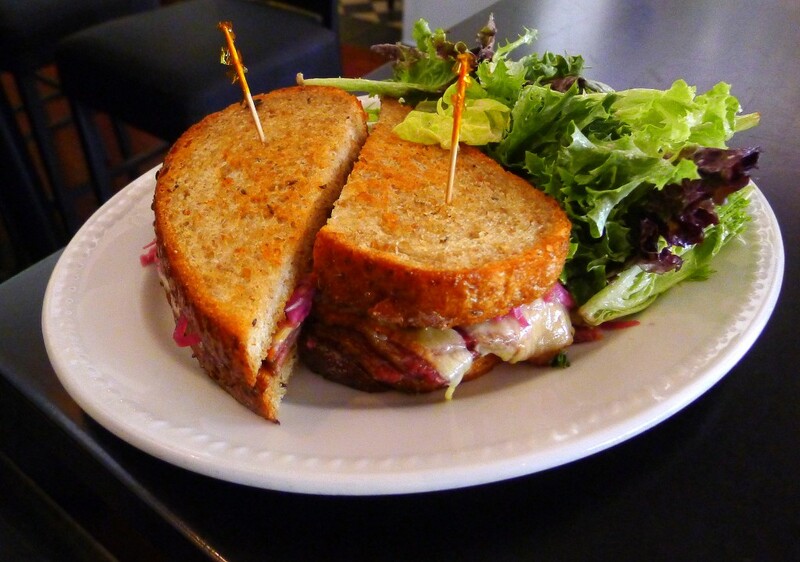 The classic Reuben is a grilled rye sandwich filled with corned beef, Swiss cheese and sauerkraut with Russian dressing. Currant takes this New York deli classic and substitutes a red-cabbage kimchi for the sauerkraut, Irish white cheddar for the Swiss cheese and a cornichon-Dijon aioli for the Russian dressing. Each change is minor in and of itself, and the sandwich is still recognizable as a Reuben, but it really is something new and better. The totality of the tweaks (combined with the outstanding house-cured corned beef) elevates the dish to something more than the sum of its parts. Like all great dishes, this is one that feels like it wasn’t created or invented, but rather has always been there, just waiting to be discovered. Currant has other good lunch sandwiches. The brasserie burger is well-executed, if not spectacular. The white cheddar and caramelized onions enhance the beef without dominating it. The thyme-laced french fries are a classic and comfortable accompaniment. Currant’s take on a French dip sandwich is also good, featuring shaved Brandt beef and those same caramelized onions, along with an au jus dipping sauce and those same fries. The burger and French dip may be good, but the sandwich to get on a lunchtime trip to Currant is the croque monsieur or the Reuben. Currant’s version of these great sandwiches of Paris and New York—one classic, one decidedly not—show that this girl really knows how to let her hair down.